My rese­arch focu­sed on the situa­ti­on of asyl­um see­kers and indi­vi­du­als retur­ned to the Greek capi­tal on the basis of the Dub­lin II Regu­la­ti­on. I spo­ke per­so­nal­ly to many refu­gees as well as rep­re­sen­ta­ti­ves of civil socie­ty, the UNHCR and the Minis­try for Health bet­ween Octo­ber 20th and 28th 2008. Time and again I was told, “the situa­ti­on is out of con­trol“. Wha­te­ver the posi­ti­on or func­tion of the Greeks I spo­ke to, the­re was total agree­ment on one point: Greece is unab­le to meet cur­rent asyl­um requi­re­ments. 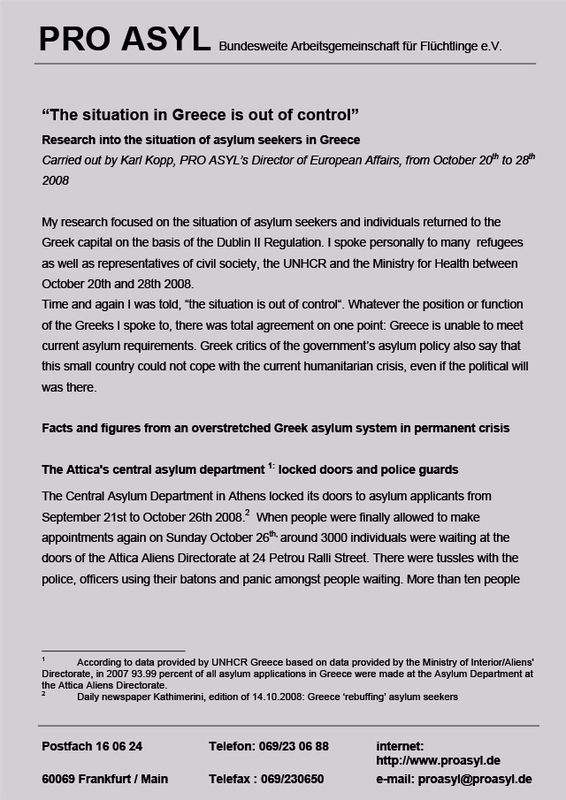 Greek cri­tics of the government’s asyl­um poli­cy also say that this small coun­try could not cope with the cur­rent huma­ni­ta­ri­an cri­sis, even if the poli­ti­cal will was the­re.